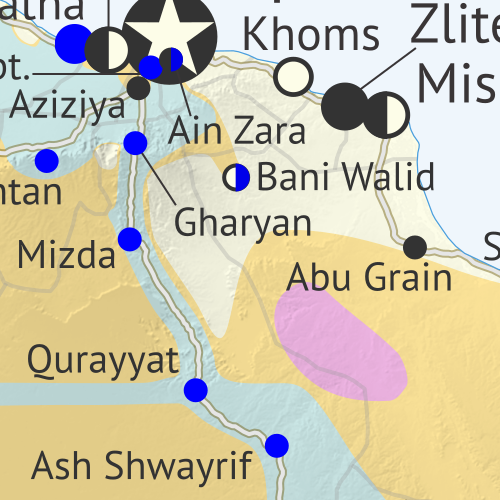 Political Geography Now: the "islamic state"
Over the past month, the so-called "Islamic State" (ISIS/ISIL) in Syria has been reduced to just a single village and some remote desert areas, while the country's north braces for a new phase of the war after US withdrawal. Detailed timeline of important events and changes to territorial control since December 26, 2018, compiled by our Syria-Iraq expert, with links to sources. Base map by Koen Adams of onestopmap.com, with territorial control by Evan Centanni and Djordje Djukic. In the month and a half since our previous Syria control map report, the main territorial changes have been losses by the so-called "Islamic State" (IS; formerly ISIS/ISIL). The Assad government has eliminated the last pocket of IS control in western Syria, in the south's Al Safa area, and the Kurdish-led Syrian Democratic Forces (SDF) have recaptured the town of Hajin in the east, while also driving IS once again off of the Syria-Iraq border. Categories: asia, conflict zones, divided countries, free conflict maps, isis, kurdistan, middle east, rebel control, syria, the "islamic state"
Since our last update in June, Somalia's civil war has continued at its usual pace, with both Al Qaeda affiliate Al Shabaab and the Mogadishu-based government coalition capturing towns from each other. Meanwhile, the armies of Somaliland and Puntland in the north are still facing off over their disputed border. See all this and more on the latest update to PolGeoNow's concise, professional Somalia control map, which includes a timeline of changes since our previous Somalia map report of June 2018, with sources cited. Want to see before you subscribe? Check out our most recent FREE SAMPLE Somalia map! Up-to-date illustration of current territorial control in Somalia, color-coded for the federal government coalition (including AMISOM peacekeepers), autonomous unionist forces, separatist Somaliland, Al Qaeda affiliate Al Shabaab, and fighters aligned to the so-called "Islamic State" (ISIS/ISIL). Areas of lawlessness or unclear control indicated separately. Colorblind accessible. Boundaries and labels for Somalia's official regions, plus control lines for the autonomous administrations of Somaliland, Puntland, Galmudug, and Khatumo. Detailed indication of city-by-city control, including many relevant smaller towns and villages. 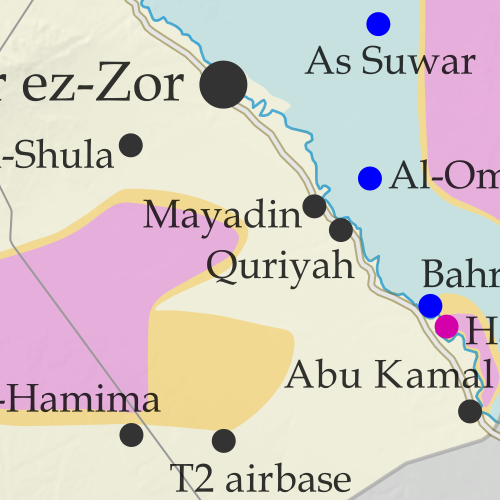 Locations of recent fighting and other important events, including Tukaraq, Bar Sanguni, Basra, and more. Detailed timeline of territorial control changes and key political developments since June 2, 2018, with sources indicated. Brief summary of the conflict situation, as well as major changes to the alignment of autonomous administrations, over the past five and a half months. Categories: africa, al qaeda, al shabaab, autonomous regions, conflict zones, divided countries, galmudug, isis, kenya, khatumo, premium, puntland, rebel control, somalia, somaliland, the "islamic state"
In the past month, a demilitarized buffer zone along government-rebel front lines has gone into partial effect in Syria's northwest. In the southeast, meanwhile, the so-called "Islamic State" (ISIS/ISIL) has reversed recent territorial gains by the US-backed Syrian Democratic Forces. See all this and more on the latest update to PolGeoNow's concise, professional Syrian Civil War control map, which includes a timeline of changes since our previous Syria map report in October, with sources cited. 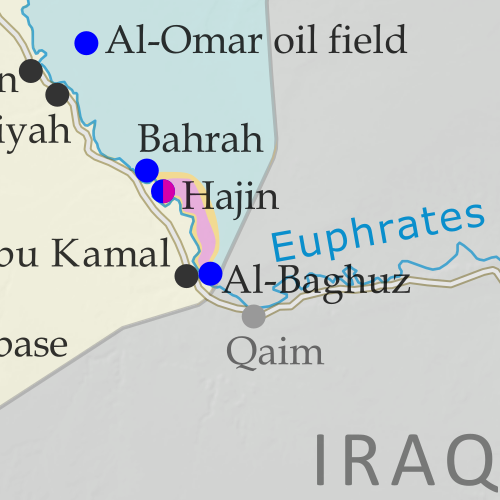 Locations of recent control changes and other important events, including Hajin, Al Safa, Baghuz, and more. Detailed timeline of important events and changes to territorial control since October 2, 2018, compiled by our Syria-Iraq expert, with links to sources. In the past month, Syria has mostly seen a break in rebel vs. government fighting, with an anticipated offensive against rebel-held Idlib province delayed amid humanitarian concerns and Turkish opposition. However, the so-called "Islamic State" (ISIS/ISIL) has continued losing ground to both the Assad government and the Kurdish-led Syrian Democratic Forces. See all this and more on the latest update to PolGeoNow's concise, professional Syrian Civil War control map, which includes a timeline of changes since our previous Syria map report in August, with sources cited. 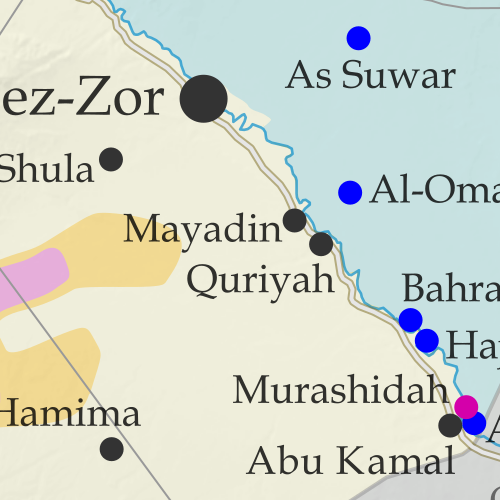 Outline showing the approximate location of the one publicly-known US "deconfliction zone". Detailed timeline of important events and changes to territorial control since August 30, 2018, compiled by our Syria-Iraq expert, with links to sources. 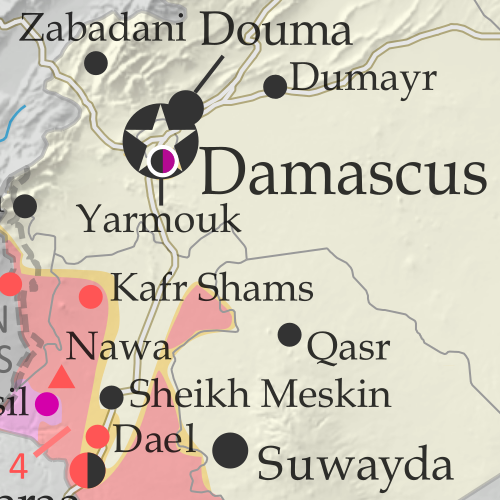 Since late July, Syria's Assad government and allies have completely eliminated both rebel and so-called "Islamic State" (IS; formerly ISIS/ISIL) control of the southwestern border area next to Israel and Jordan. IS has also lost territory elsewhere in the southwest and in Syria's far eastern desert regions. 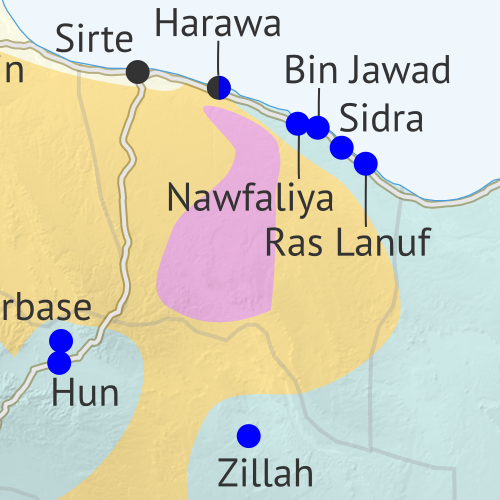 Locations of recent control changes and other important events, including Quneitra, Tasil, Al Safa, Al Kara'a, and more. Detailed timeline of important events and changes to territorial control since July 25, 2018, compiled by our Syria-Iraq expert, with links to sources. Brief summary of the current situation and of major changes to the configuration of territorial boundaries and de facto enclaves and exclaves. 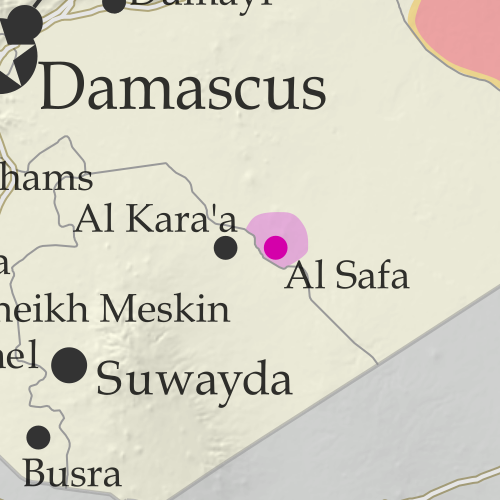 Since late June, a rapid government offensive has completely driven rebels out of southwestern Syria's Daraa province, which they had controlled about half of. 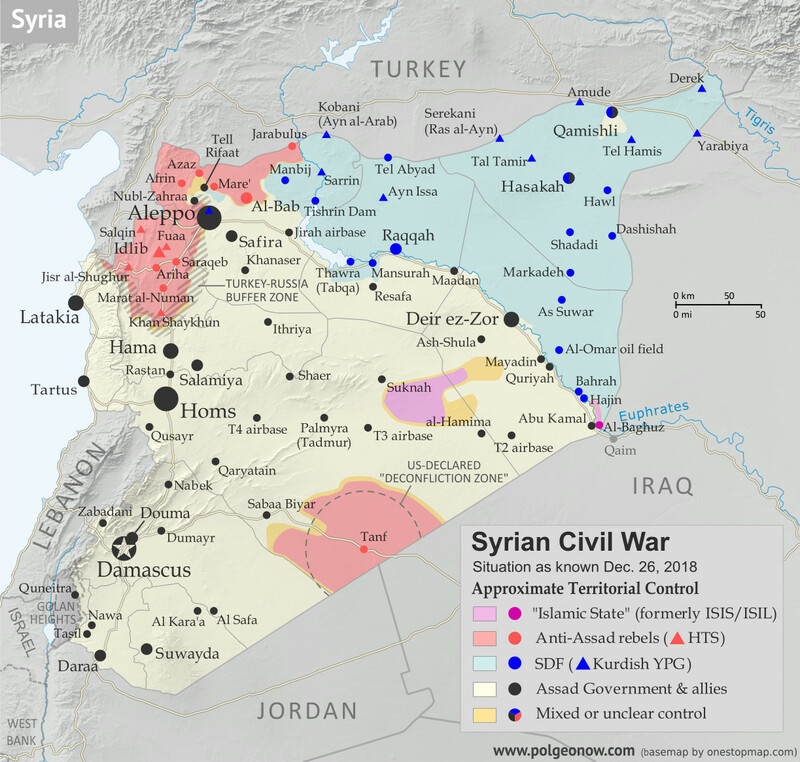 Meanwhile, the government has surrendered an enclave of control within rebel-held northwestern Syria, and the so-called "Islamic State" (ISIS/ISIL) is struggling to hold onto pockets of territory both east and west. See all this and more on the latest update to PolGeoNow's concise, professional Syrian Civil War control map, which includes a timeline of changes since our previous Syria map report in June, with sources cited. 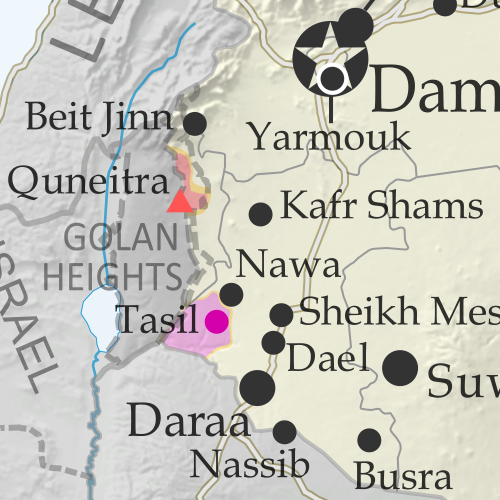 Locations of recent control changes and other important events, including Daraa, the Golan Heights, Busra, Nawa, Fuaa, and more. Detailed timeline of important events and changes to territorial control since June 21, 2018, compiled by our Syria-Iraq expert, with links to sources. Base map by Koen Adams of onestopmap.com, with territorial control by Evan Centanni. All rights reserved. 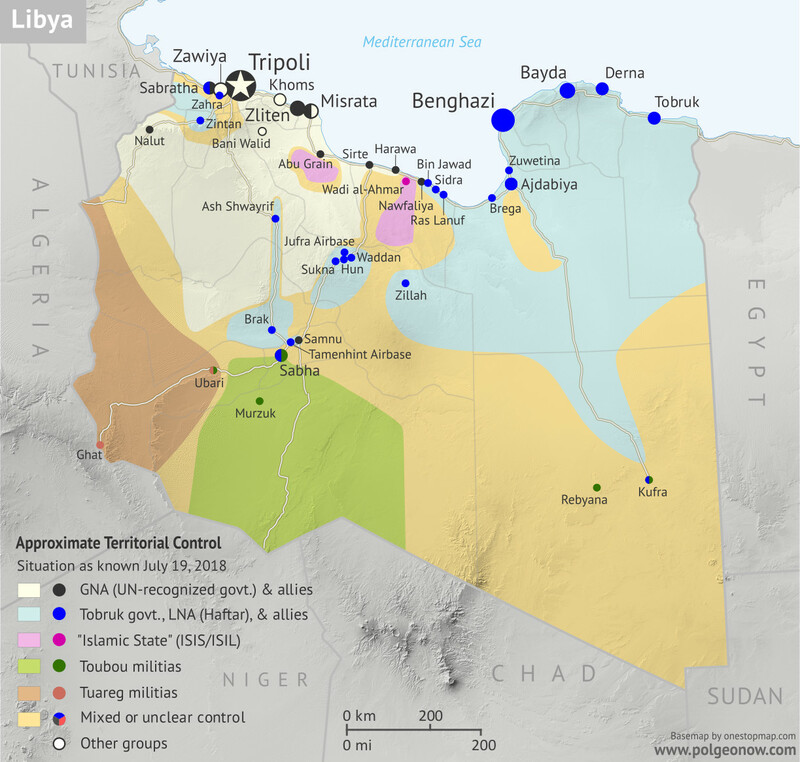 Ten months after our previous Libya control map and report, the country remains divided between two major rival governments and several smaller groups, but there have been a few changes to their areas of control. 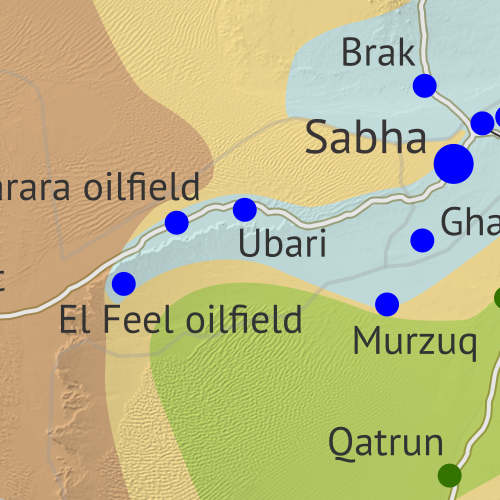 This is the first free edition of our map that also shows the territories of the Toubou and Tuareg militias in Libya's south, which align on and off with the country's two major governments. Categories: africa, conflict zones, divided countries, free conflict maps, isis, libya, original maps, rebel control, the "islamic state"
Since late May, fighting between government and rebel forces in Syria has subsided, but battles against the so-called Islamic State (ISIS/ISIL) have continued in both eastern and western parts of the country. See all this and more on the latest update to PolGeoNow's concise, professional Syrian Civil War control map, which includes a timeline of changes since our previous Syria map report in May, with sources cited. Locations of recent control changes and other important events, including Dashishah, Al Kara'a, Manbij, and more. Detailed timeline of important events and changes to territorial control since May 23, 2018, compiled by our Syria-Iraq expert, with links to sources. There are newer version of this map available. To see them, view all Somalia articles on PolGeoNow. 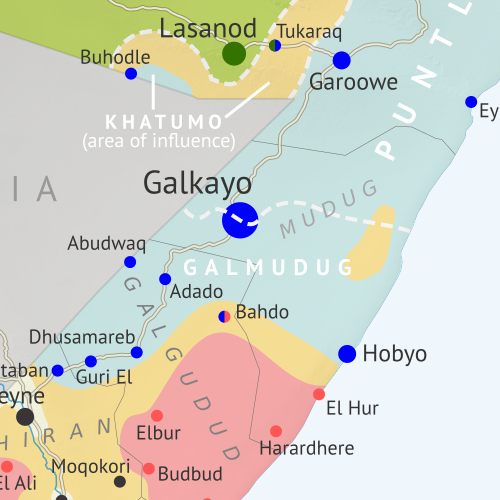 In the last two months, several towns in southern Somalia have changed hands between Al Shabaab and government-allied forces, while political realignments have continued to change the country's map of autonomous states. See all this and more on the latest update to PolGeoNow's concise, professional Somalia control map, which includes a timeline of changes since our previous Somalia map report of March 2018, with sources cited. 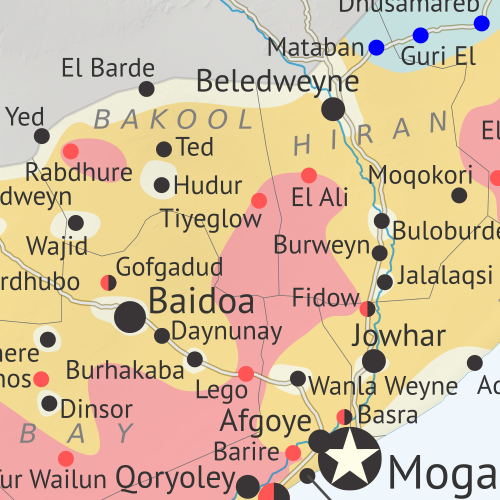 Locations of recent fighting and other important events, including Tukaraq, Moqokori, Bulo Haji, Bali Khadar, and more. Detailed timeline of territorial control changes and key political developments since March 28, 2018, with sources indicated. Brief summary of the conflict situation, as well as major changes to the alignment of autonomous administrations, over the past three months. Categories: africa, al qaeda, al shabaab, aswj, autonomous regions, conflict zones, divided countries, galmudug, isis, kenya, khatumo, premium, puntland, rebel control, somalia, somaliland, the "islamic state"
In the past month, Syria's rebels have lost one of their biggest enclaves of control - "Zone 2" near the city of Homs, including their oldest stronghold in Rastan. Meanwhile, the national capital has been completely cleared of rebel and "Islamic State" control pockets. See all this and more on the latest update to PolGeoNow's concise, professional Syrian Civil War control map, which includes a timeline of changes since our previous Syria map report in April, with sources cited. Locations of recent control changes and other important events, including Rastan, Yarmouk, Baghuz, and more. Detailed timeline of important events and changes to territorial control since April 25, 2018, compiled by our Syria-Iraq expert, with links to sources. In the last six weeks, Turkey-led forces have expelled the Kurdish YPG from its stronghold in Afrin, while the three major pockets of rebel control near Damascus have all been wiped off the map. See all this and more on the latest update to PolGeoNow's concise, professional Syrian Civil War control map, which includes a timeline of changes since our previous Syria map report in March, with sources cited. Locations of recent fighting and other important events, including Afrin, Douma, Dumayr, Sabaa Biyar, and more. Detailed timeline of important events and changes to territorial control since March 16, 2018, compiled by our Syria-Iraq expert, with links to sources. Brief summary of current situation, as well as major changes to the configuration of territorial boundaries and de facto enclaves and exclaves. Since last summer, Al Qaeda's Al Shabaab affiliate has lost some key towns in Somalia, but also had some victories - all this amid increasing US military involvement. Meanwhile, two pairs of rival governments farther north are moving towards unification. 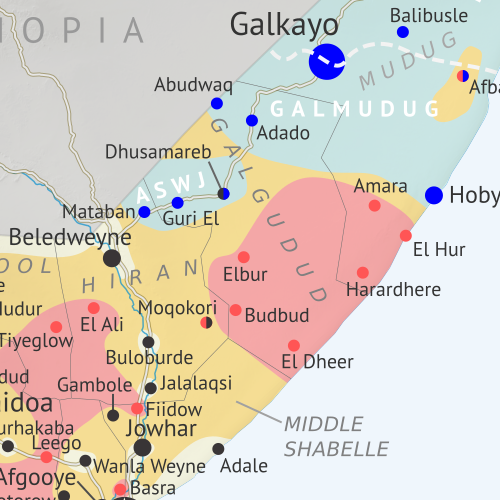 See all this and more on the latest update to PolGeoNow's concise, professional Somalia control map, which includes a timeline of changes since our previous Somalia map report of August 2017, with sources cited. Up-to-date illustration of current territorial control in Somalia, color-coded for the federal government coalition (including AMISOM peacekeepers), autonomous unionist forces, separatist Somaliland, Al Qaeda affiliate Al Shabaab, and fighters aligned to the so-called "Islamic State" (ISIS/ISIL). Areas of lawlessness and unclear control also clearly marked. Colorblind accessible. Boundaries and labels for Somalia's official regions, plus control lines for the autonomous administrations of Somaliland, Puntland, Galmudug, ASWJ, and Khatumo. 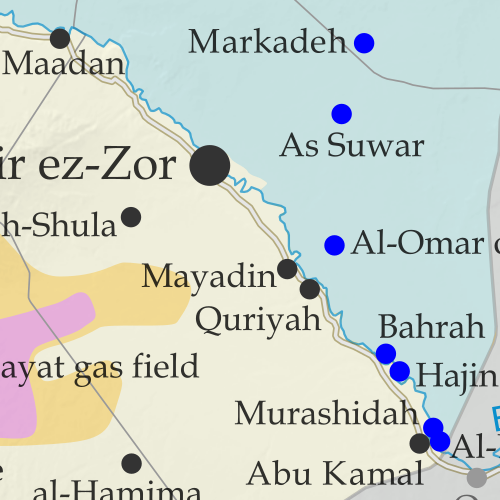 Locations of recent fighting and other important events, including Bariire, Basra, Sablale, Torotorow, Tukaraq, and more. 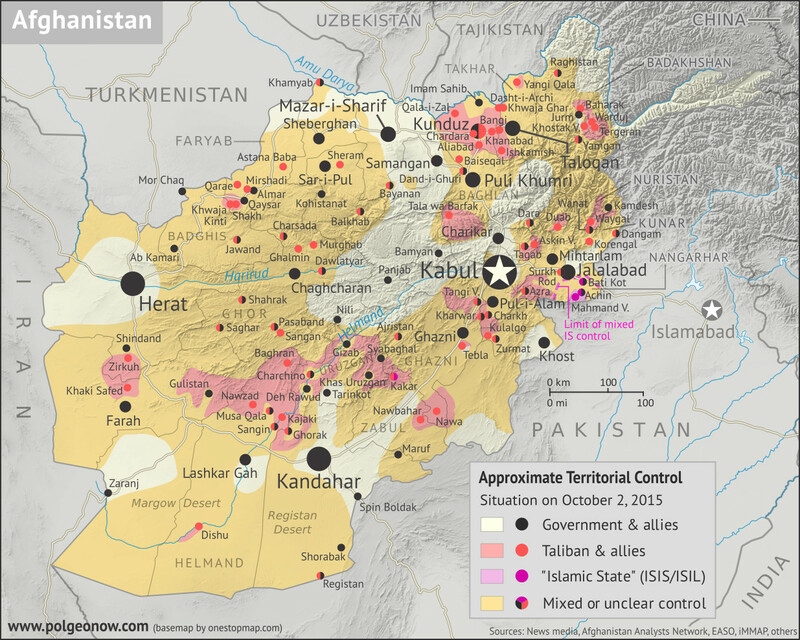 Detailed timeline of territorial control changes and key political developments since August 25, 2017, with sources indicated. Brief summary of the conflict situation, as well as major changes to the alignment of autonomous administrations, over the past seven months. Over the past month, fighting has raged in three major flashpoints in Syria, with the Turkish invasion of Afrin, Assad's new ground war against rebels near Damascus, and heavy infighting between rebel groups in the north. 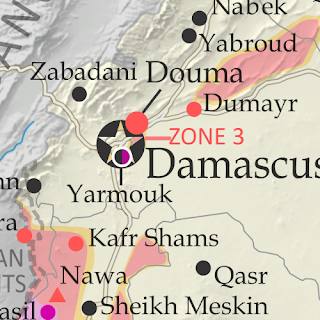 See all this and more on the latest update to PolGeoNow's concise, professional Syrian Civil War control map, which includes a timeline of changes since our previous Syria map report in February, with sources cited. 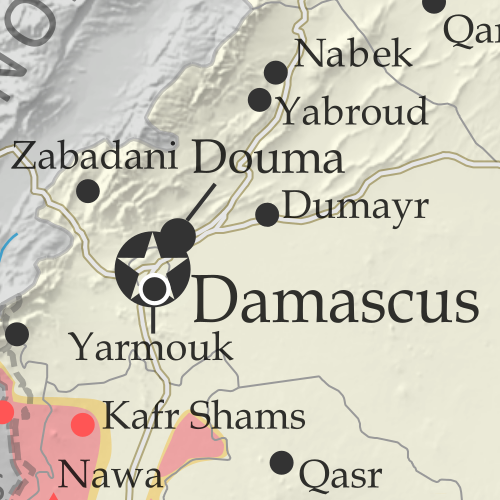 Special symbols indicating towns dominated by rebels of the former Al Qaeda Nusra Front (now Hayat Tahrir al-Sham or HTS) and by the US-backed Syrian Democratic Forces (SDF). 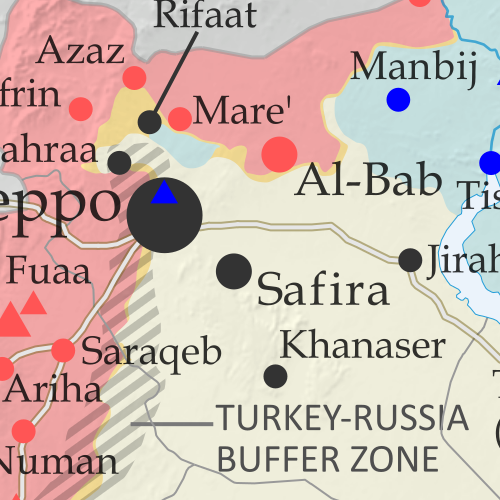 Locations of recent fighting and other important events, including Kurdish Afrin, the Eastern Ghouta rebel zone near Damascus, and more. Detailed timeline of important events and changes to territorial control since February 13, 2018, compiled by our Syria-Iraq expert, with links to sources.